Master developer Nakheel will unveil a luxury high-rise beachfront residential project on Palm Jumeirah as part of $1 billion worth of projects set to be launched at this year’s Cityscape. The 38-floor development, called Palm Beach Residences, will feature 250 luxury one, two and three bedroom apartments, topped off by a sky lounge on the top floor that will have views of the surrounding Dubai skyline. Among the other projects set to be unveiled tomorrow will be Discovery Gardens Mall, a retail, hospitality and healthcare development. Transforming the existing Discovery Gardens Pavilion, the project will include 370,000 square feet of new shop space and a 350-room hotel. Construction is expected to begin in Q2 2018. In close proximity, Nakheel will also develop Jenan Heights, a new gated community of 2,500 homes spread over nine towers. Jenan Heights, like Discovery Gardens Mall, will be connected to a Dubai Metro station currently under construction as part of the Route 2020 Metro extension project. Jenan Heights is due to break ground in Q2 2018. Nakheel will also announce two projects at Jumeirah Park community, where it has already delivered around 2,000 villas, with more under construction. Jumeirah Park Villas will include 174 luxury four bedroom residences, ranging from 3,650 sq ft to 4,150 sq ft in size, and come with a private garden, rooftop entertainment space, maid’s room, study and double garage. Construction is due to start in Q2 2018. The launches will also include Jumeirah Park Leisure, also located in Jumeirah Park, which will include an Olympic-size pool, 16,000 sq ft gym, spa, dining and retail. Construction is expected to begin in Q2 2018. Nakheel will also develop Jumeirah Village Circle Hotel, a new 252-room, mid-scale hospitality offering in the JVC master community. The hotel, will have an all-day restaurant, café, pool, gym and car park. The master developer said it is currently in talks with several prospective operators for the hotel, which is due to break ground in Q2 2018. Deira Islands will also see a further injection of $45 million (AED165m) investment in six marinas at the 15.3 sq km master development. Accommodating 614 boats and yachts up to 60 metres in length, the marinas are due for completion by the end of 2019, with phased construction starting Q4 2017. 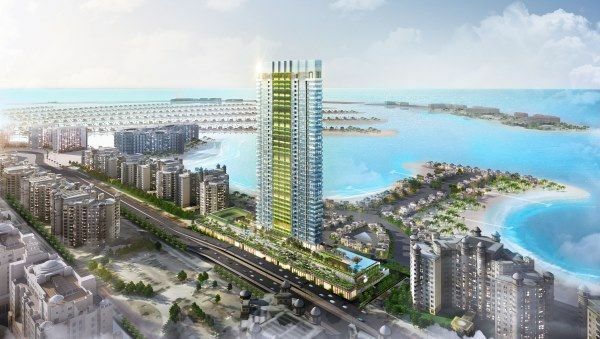 Nakheel has invested $2 billion (AED7.5bn) in infrastructure and construction contracts for Deira Islands so far. “Nakheel is playing a pivotal role in realising the Government of Dubai’s vision by creating new, iconic developments across the city,” said Nakheel chairman, Ali Rashid Lootah.